Deep Breath was both stunning a bit of a mess. Regardless, the season opener and introduction of Peter Capaldi's Twelfth Doctor has certainly got fans interested about where the Doctor is going this season and who he is becoming. Jenna Louise-Coleman's Clara and the new, much older looking Doctor, find themselves in the belly of a Dinosaur when it swallows the TARDIS. Unfortunately, dragged along for the ride when the Doctor tries to escape, it ends up trapped in Victorian England. Follow me under the cut for more on this week's episode of Doctor Who. 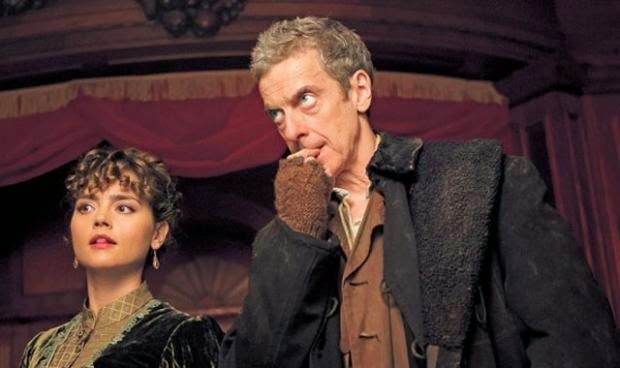 Deep Breath started off utterly disjointed and frustratingly poor. We see Vastra, Jenny and Strax again as they are summoned to the sighting of a dinosaur stomping around near Big Ben. Soon the dinosaur coughs up a TARDIS and things become clear... well, not really. Out spills Peter Capaldi's Twelfth Doctor in the throws of post-regeneration confusion and post-Matt-Smith-Doctor gesticulation. This whole opening sequence and the next twenty minutes were painful to watch. They made very little sense and the performances were not only lacklustre but at times down right terrible. Having Peter Capaldi's flailing around and pretending to flirt with a prehistoric creature and then jump across rooftops in a nightgown and slippers was not only absurd but just didn't really come across the way I think it was intended. It takes a particular talent to be the childish clown that the Doctor was during Matt Smith's run and that is not Capaldi's game or skill set. He looked ridiculous and it wasn't heart-warming or fun; it was distressing. Thankfully, he didn't have to do this kind of clowning for much longer. Clara was pretty flat, and not just in a post-regeneration shock kind of way. The performance actually lacked any real emotion and I wonder whether having Vastra, Jenny and Strax there actually cause more harm than good even if the viewer is familiar with them. Looking back to the way Rose handled the Tenth Doctor when he had just arrived, I have a lot more appreciation for what Russell T Davis did with that transition. Clara's scene with Vastra and talking about the veils or masks that people wear and the Doctor wanting to fit in and be loved and accepted and challenging Clara to respond was the saving moment of the beginning of the episode, and although it was good, it made very little sense as delivered and was stymied with all of the beating over the head we often get about Vastra and Jenny being married and Strax being an alien. Great. No. I zoned out for a bit but the moment I thought the episode might be taking a different turn came when Capaldi's Doctor has a manic conversation with a homeless man. This was a much more integrated performance, linking the zany aspects of Smith's Doctor with the new Doctor developing before us. He asks why Eleven chose this face for him. Why his eyes are so angry, why his eyebrows are so angry. What was his previous self really saying? Why couldn't he just come out and say it. We watch him bully a homeless man for a coat and although he says that he swapped his watch for the coat later on, one cannot help but wonder by the end of the episode whether he had stolen it. 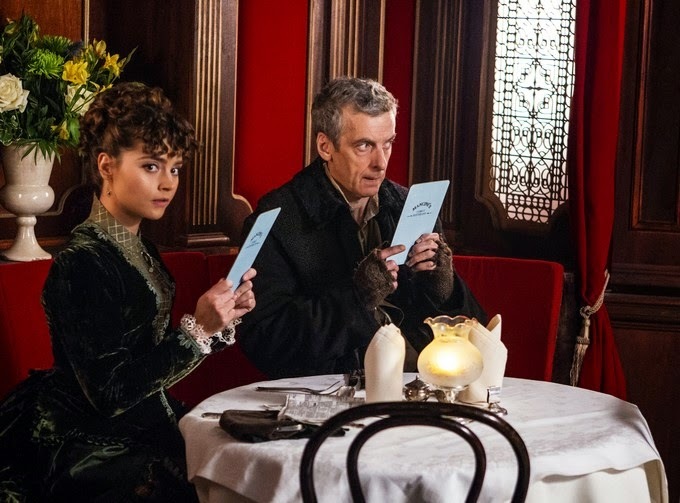 The next great moment, and where the episode really picks up, is the scene between Clara and the Doctor in a family restaurant. They both respond to an ad in the paper to meet for lunch to talk and it takes them quite a while to realise that they have been lured into a trap. Their banter in this scene is the kind of thing that makes me really excited about Doctor Who. The relationship between the Doctor and the Companion is critical and for the first time in ages it seemed like it was going to be much more mature, much more intelligent and feisty. Their acid tone with one another and sharp wit kicked Clara back up into the Companion that I thought we were getting when we originally saw Oswin Oswald and the Victorian era Clara. We are faced with the adversary for the episode, part machine and part organic, harvesting replacement parts to get to the Promised Land, a shadow of who or what they used to be. These creatures were not as scary as their previous incarnations but the sequences in which characters had to hold their breath in order to pretend that they were one of the machines were particularly well orchestrated. The Doctor seemingly abandons Clara and the feeling of betrayal is palpable. Clara handles herself really well and with bravery and as she trusts and predicts, the Doctor never really left her but used her for her skills. There's a large part of me that howls with excitement over this development because I am so sick of the Companion's not being allowed to stand on their own two feet and this has happened a lot recently. Clara totally owned her moment and the Doctor trusted that she could. Their relationship will hopefully be far more equal from this point on. Particularly harrowing is that the creatures have built a hot air balloon out of human skin to escape in. The tone shifts here with both this revelation and the appearance of the Doctor telling the leader of the machines that he might have to kill him to save the people that he loves on Earth. The machine tells the Doctor that self-destruction is against his nature. The Doctor says that murder is against his own, but that one of them is lying. The machine is seen dead afterwards, and although we are lead at first to believe that perhaps this is because he jumped, we are quickly challenged to consider that the Doctor was actually the one who was lying and had pushed him. Clara struggles with who the Doctor is becoming and wondering whether she truly knows who he is and this leads to perhaps the greatest part of the whole episode and certainly the thing that is worth watching for. The Doctor offers to drop her home and tells her that he isn't her boyfriend. When Clara responds that she never thought he was, he admits that she wasn't the person responsible for that misinterpretation. It's a beautiful revelation and a much more mature way of dealing with the way that Matt Smith's Doctor treated Clara. As she exists the TARDIS her phone rings. On the other end is a dying Eleventh Doctor, tying up the loose end from the Christmas episode, telling her that the man who is with her, who he hopes is with her, is the same Doctor and that he needs her help now more than ever. It's tender and a perfect way of stitching the two incarnations together. I was truly moved. In that moment I had been really missing Eleven and right like the Doctor always does, he appeared and said exactly what he needed to say, and it translated onto Capaldi's performance perfectly. It also means Eleven's treatment of Clara in those final moments makes much more sense. He was letting go of Amy but he was taking Clara with him. Capaldi's Doctor tells Clara that it's painful for him to see that she is looking at him but she can't see him. It's a tender, dark and wonderful moment. When she does I felt entirely like the kids in Hook finally seeing that Robin William's is actually Peter Pan returned as an older man. She hugs him and he says that he doesn't think he's a hugger, which was the perfect amount of humour for a scene like that. It has aspects reminiscent of Christopher Eccleston's Doctor who I loved. If that is where Capaldi is going, with another great Companion and perhaps with a few less moral scruples then I am definitely excited about what this season will bring. I am especially looking forward to the relationship with Clara growing and changing, although I have some trepidation about the new Companion that is on the way. It's definitely great to have the show back and hopefully with some hard work Moffat and his team can rise past some of his previous hang ups and get to a really good place. I'd like to see some tighter and darker stories and I would like to never see River Song again and if the woman at the end was some other incarnation of River I am going to break something. Part of me thinks it's The Master though so let's see how that plays out. Finally, I am not sure about the new opening credits but the music is pretty good! The TARDIS interior is pretty cool too. Very understated, much like Capaldi's choice of costume. Arrow Seasons 1 & 2!